In February, Cadiz becomes a party. It’s Carnival time. The joy of the Cadiz carnival fills the streets. 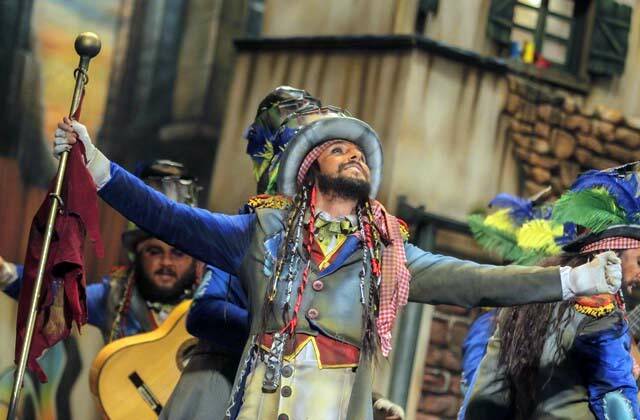 The city becomes a stage and its people the main actor because Don Carnal arrives. The whole town is committed to the carnival, it is a perfect opportunity to know and enjoy the wit and grace of Cadiz. The carnival music is heard in every corner, the details of the costumes are completed (in Cadiz are known as ‘tipo’), some of them true works of art and Cadiz lives with all its heart one of the most anticipated playful events, perhaps one of the Spanish carnivals which has a more playful and funny image. Faced with the spectacle of other carnivals, the humorous and funny image of the Cadiz Carnival makes it a unique event, it’s worth knowing. 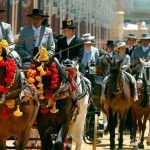 During these days there is no shortage of other shows for the fiesta in Cadiz to be complete. Despite the fact that experts place the origin of the carnival in the Bacchanalian feasts of Greece and Rome, it seems that in the case of Cadiz its roots are anchored in Christianity. Without the idea of Lent, the way it is known since ancient times and that alternation of happy and sad events that established the first Christian calendars, would not exist. The first documented references to the carnival celebration known so far in Cadiz are found in the work of the Cadiz historian Agustín de Horozco. They date from the late XVIth Century and argue that in times of carnival, the people of Cadiz plucked flowers from the pots to throw them at each other as a joke. The City Council did not recognize the Carnival as a festivity in itself until, in 1861 Mayor Juan Valverde proposes to make the City Council the one in charge of the organization of the Carnival, for which it is requested that in the 1862 budget, expenditures were provided for this festival. We can say that it is when they begin to have a “regulated” Carnival. 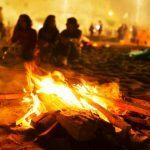 Despite the fact that it has been through wars, different systems of government and times of censorship, the Carnival of Cadiz has survived in its essence, becoming an unavoidable date to visit the provincial capital. 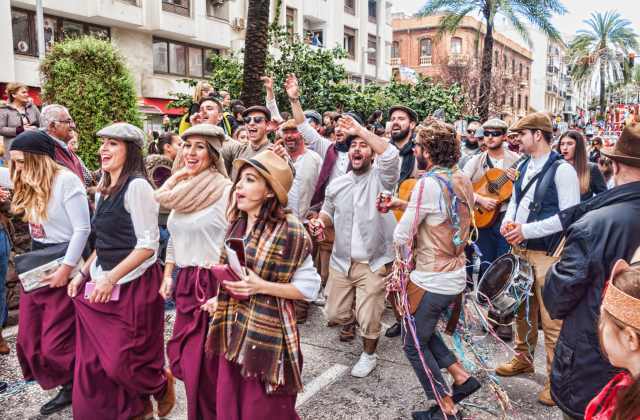 Taking advantage of the rehearsals of the various groups presented to contest a few years ago some peñas began organizing street events, as a first contact of these with the public. 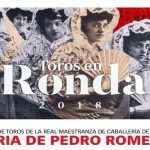 In order to attract more people and give a festive air to the meeting, the peñas offered tastings of the most varied and exquisite delicacies: ostionadas, erizadas, pestiñadas, potajadas, fritadas, tortilladas, berzadas,… allowed, from party to party, to enjoy the essence of the Cadiz cuisine. The “Pestiñada”, organized by the peña ‘Los Dedócratas’, the Saturday before the start of the Concurso del Falla. 12,000 pestiños will be shared with its corresponding glass of anise. The “Erizada”, organized by the peña ‘El Erizo’, on the next day of the pestiñada. The Erizada is the dean of the Gastronomic-Carnival celebrations held in the provincial capital. 400 kg of sea urchins will be distributed. The “Ostionada”, organized by the peña “El Molino”, on the same day of the erizada. 1,500 kg of free oysters will be shared. 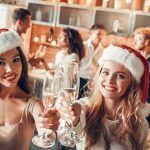 Among the three they have managed that the week before the start of the contest has acquired its own festive where pestiños, sea urchins and oysters are mere excuses to enjoy listening to the first songs of the year. The costume is the real king of the carnival. Either individually, in pairs, or in groups; dress up is almost mandatory, especially the first Saturday of carnival. 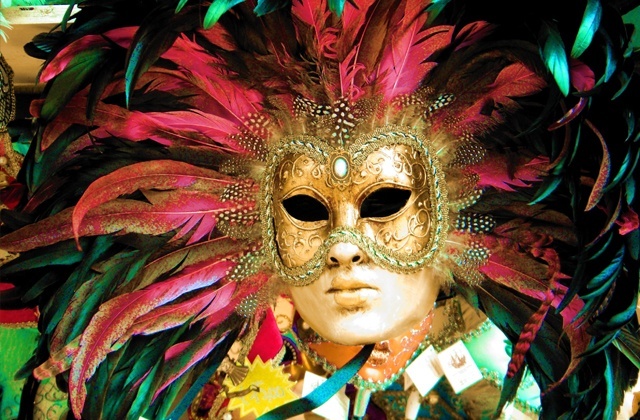 The ideal times to wear your costume is the first Saturday of Carnival and in any of the parades that take place. Carousels choirs celebrate the festive days of Carnival, traditionally around the market square. Choirs sing on punts and offer their tangos to the thousands of people who throng the square. The success of the carousels is causing new routes to open through other streets and squares of the city during the week. If you visit Cadiz on the first Sunday of Carnival, go and see them, never before one o’clock in the afternoon, and you will enjoy several hours of joy. In the numerous bars around you savor the typical products of the land and take a break between performances. Two parades are held during the Carnival. The one on the first Sunday runs through the entrance Avenue of the city and attracts thousands of visitors in a show full of color and joy. It has been estimated that more than 100,000 people, including locals and outsiders, invade the avenue leading to the city, turning often, into active characters in the representation. This unceasing parade of floats, costumes groups and groupings, needs more than 4 hours to travel the approximately 3,500m. of its itinerary. 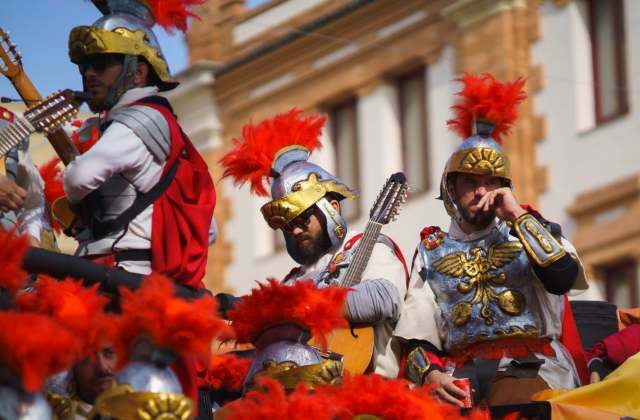 The second parade, known as the ‘Parade of Humor’ is celebrated on the last Sunday and runs through the historic center, with the most riotous display of costumes and street participation ever seen. The so-called ‘illegal’ or also called ‘family‘ groupings were born several years ago as a more popular form of participation in the Carnival. Many fanfares composed of groups of friends, colleagues, peñas, families, etc. rival with ‘official groupings’ in their repertoire. The door to the Post Office building in the Plaza de las Flores, during Carnival becomes the real ‘Falla Theatre’ for these groupings. With a possibly spontaneous origin, a group of friends gathered to sing on the streets of Cadiz. Thus the carnival groups are born, which begin to perfect themselves while they gradually align, preparing a repertoire and rehearsing it over the years. 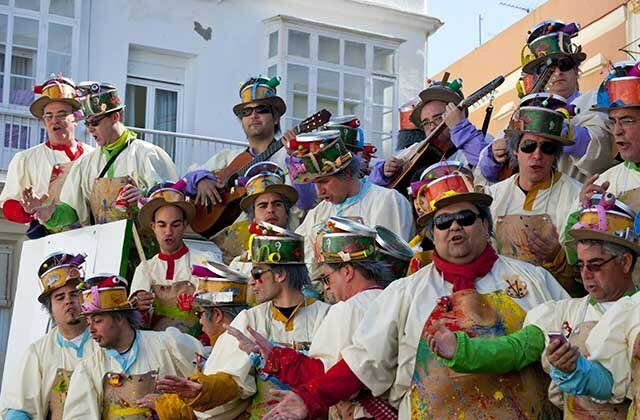 These groups, of music vocal ensembles, that sing their own repertoires and of a marked Cadiz character, will gradually start becoming one of the axes of the Carnival of Cadiz, without forgetting the masquerades and, above all, the street as a dynamizing element of popular participation. Already in the War of Independence, there is evidence that ballads were made to mock the French but, this practice has been intermittently in history as different governments have censored the Carnival of Cadiz. It was within the Franco dictatorship, after a tragedy that struck the town of Cadiz, when the City Governor asked the dictator permission to resurrect the carnival and so encourage the neighbors. Thus it was, after the explosion of the mines’ deposit of San Severiano in 1947 that claimed 200 lives, that the people of Cadiz could regain their ballads (although with censorship) . Currently the carnival groups are the main axis of the Carnival of Cadiz. If you came to the provincial capital at this time, do not hesitate to come out to hear their witty lyrics. 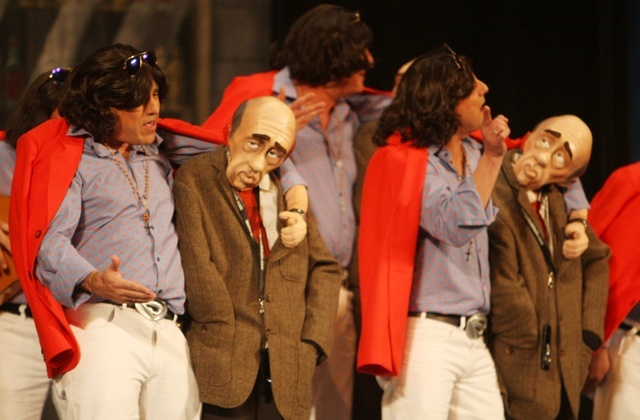 Ridicule, satire and political and social criticism are present in a competition for the different types of these groups in the Falla Theater. Political corruption, crisis and the grapes that Andalusians did not take to start this 2015 emerge as the leading themes of this edition. 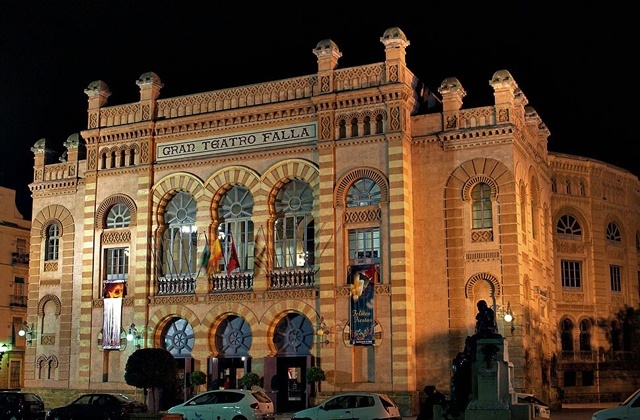 The competition of the Gran Teatro Falla has a great popular root, not only in Cadiz tourism, but in the rest of the province and Andalusia. 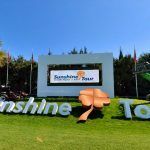 For about 20 days, more than 100 groupings compete for the passage to the semifinals and final phase, where only manage to get a maximum of four groupings per type. The final competition is held on the Thursday of the week before the start of the holidays and is concluded Friday morning. Despite the long duration of the show, this is followed by hundreds of thousands of people through television and radio (Canal Sur TV and Canal Sur Radio have Carnival specials on these dates). 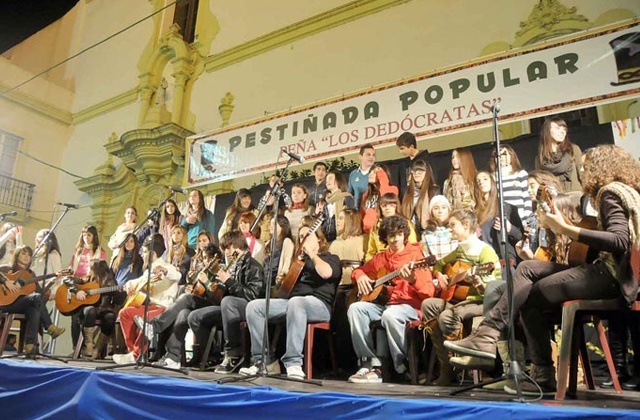 The four types of groupings participating in the Concurso del Falla are: Choirs, Comparsas, Chirigotas and Quartets. If you’re not from Cadiz, do not worry. We suggest a perfect plan for you to live the carnival without missing a thing. Normally this festival is lived among friends, where in a portable cooler, the bottles of typical wine of the region are stored. 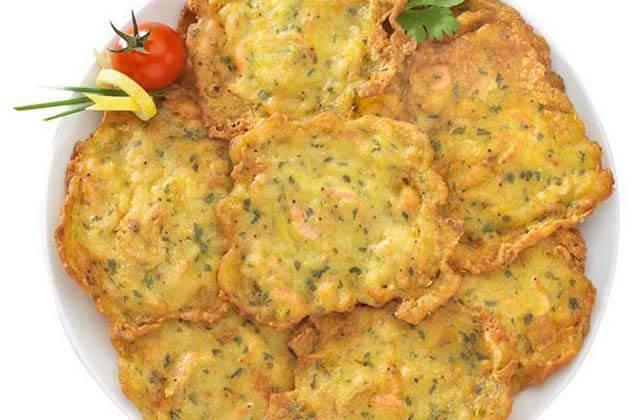 It is common to approach the street stalls to taste the shrimp pancakes. Among them you can find the one of La Guapa, the one of the fried little fish of the Galician and, at the time of tapas, already more seriously, you can approach the Manteca, by the car pound, to taste their sausages in brown paper. The Market Square or the Plaza de las Flores are some of the small squares where “illegal gatherings”, i.e. those that are not in the competition, are thrown into the streets to sing their ballads that are even more irreverent. You can stop to hear their occurrences and you will have a great time with their lyrics. This is the authentic soul of Cadiz. The streets full of disguised people, drinking and eating on the streets and enjoying the street songs. 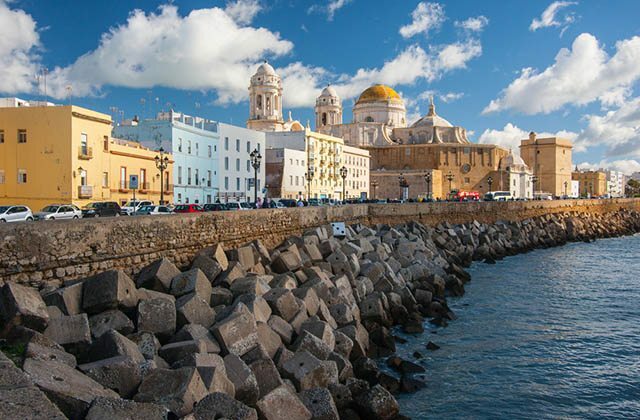 Since you visit Cadiz, you cannot leave without enjoying one of the most charming capitals of Andalusia. We recommend you take a walk through the traditional neighborhood of the Vine or that of Populo where you’ll find the most traditional of the city and where, also, you will be able to enjoy tapas. You have to enjoy the Cathedral of Cadiz, on the beachfront, as well as, while it is Carnival, the stunning Falla Theater. Other outstanding monuments are the Puerta de Tierra or the Church of San Antonio. Do not hesitate and escape to Cadiz, in February. 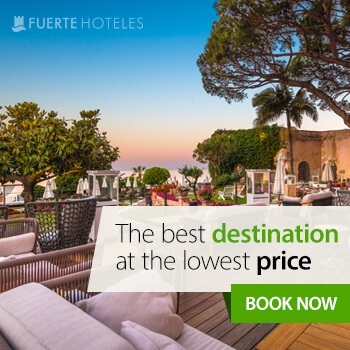 Fuerte Hoteles is always the best option to stay in Andalusia, know its cities and rest. The chain has facilities where you can enjoy, in addition to its services, the best of each point of the region, a good example is Fuerte Grazalema, nestled in the mountains and with a spectacular pool that makes you forget everything and enjoy the most relaxing holiday in the most natural way. On the other hand, if you prefer lounging on the beach, the hotel Fuerte Conil is located opposite to one of the most beautiful beaches of Spain, the beach of La Fontanilla. 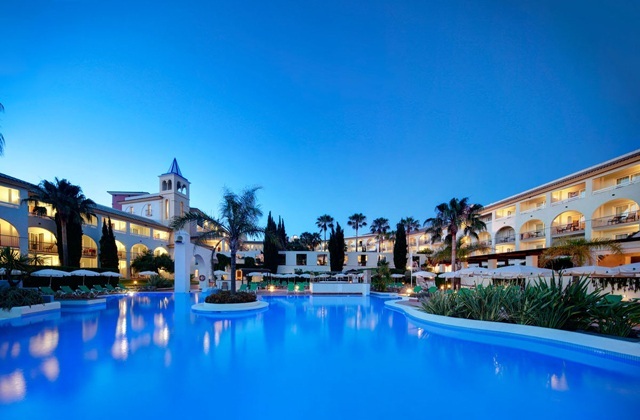 It is noted for its unique Andalusian style, its 25,000 square meters of gardens, 4 outdoor pools, Jacuzzi, tennis courts and a full equipped Spa. JEREZ FAIR. PAST AND PRESENT OF THE HORSE FAIR.